Ah, neurobiology, my old foe. 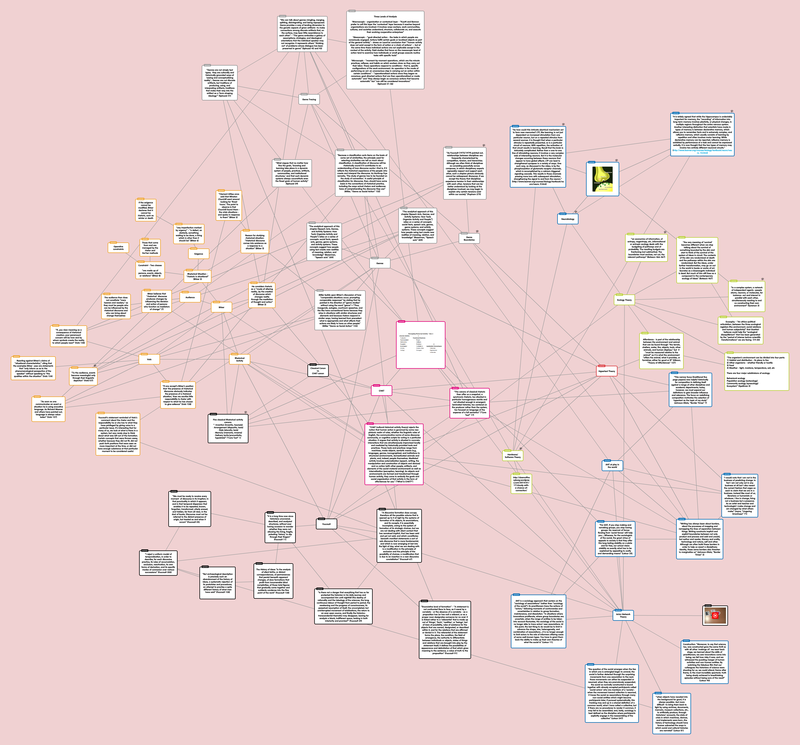 It’s time to take your place in the midst of my mindmap (or on the outskirts? ), but where should you go? Hell, what should I add? How do I place science within a brainstorming network of other (less science-y) theories of network? Well, that’s always a good question. Neurobiology is the perfect network, with everything (ideally) functioning as a highway system of information, constantly moving between the neurons. The two theories that make the most sense for a direct connection are Hardware/Software Theory and Ecology Theory (with Bateson, in mind, as the top contender). 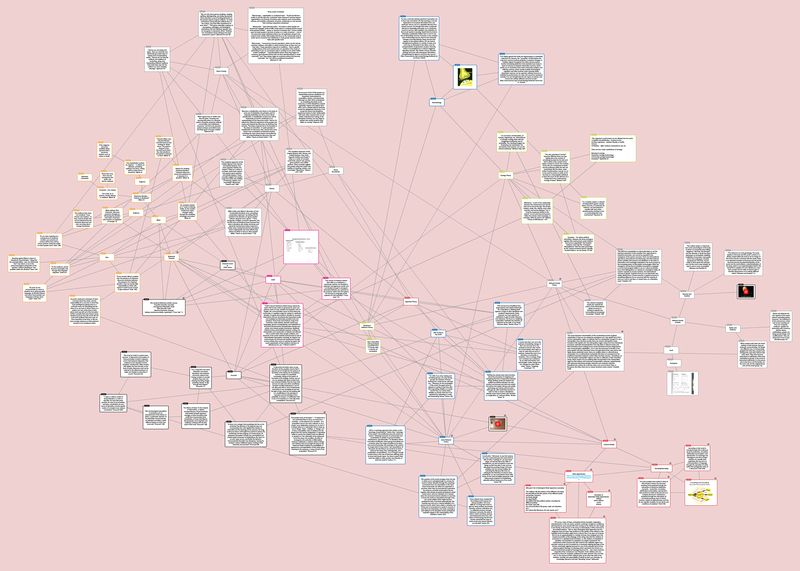 The trouble I had choosing the nodes and making the connections was how specific neurobiology is and how technical the jargon remains. 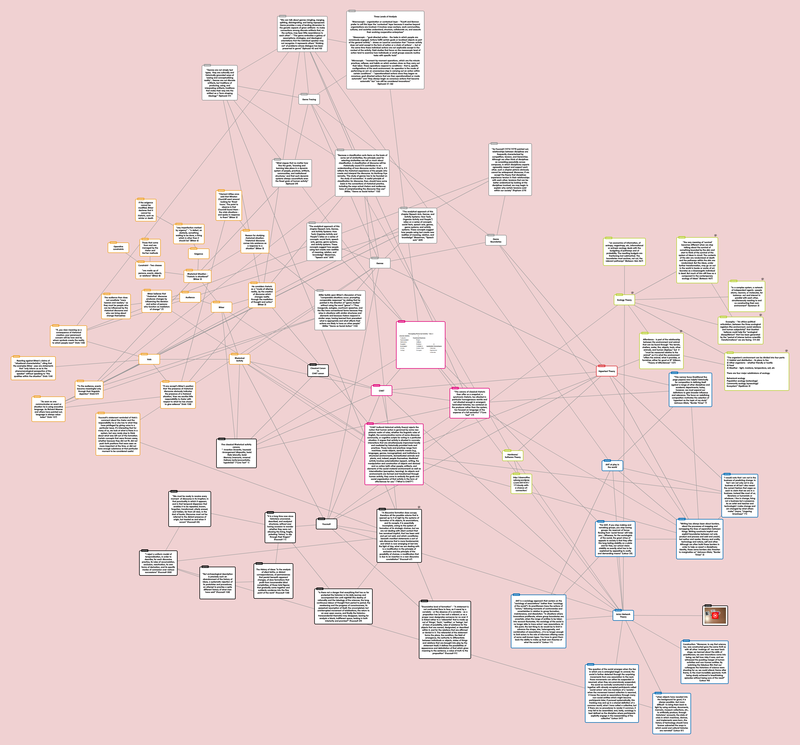 Now that I have my overarching connections between theories, let’s start with my new nodes. First node deals with learning and memory: “So how could this intricate electrical mechanism act to form new memories? LTP [Long-Term Potentiation], like learning, is not just dependent on increased stimulation from one particular neuron, but on a repeated stimulus from several sources. It is thought that when a particular stimulus is repeatedly presented, so is a particular circuit of neurons. With repetition, the activation of that circuit results in learning. Recall that the brain is intricately complicated. Rather than a one-to-one line of stimulating neurons, it involves a very complex web of interacting neurons. But it is the molecular changes occurring between these neurons that appear to have global effects. LTP can lead to strengthened synapses in a variety of ways. One such way, as discussed in the video, is by the phosphorylation of glutamate receptor channels, which is accomplished by a calcium-triggered signaling cascade. This results in those channels passing more ions with subsequent stimulation, strengthening the signal to and from the neuron.” The inclusion of a quote on memory made the most sense to me. Memories are the very fabric of information coming and going. It seems like for every memory that is created, another one is replaced (or, it seems, five in my case). The idea of repetition of stimulus reminds me a lot of what I imagine occurs within the cloud network that connects all of our lives, and how the transfer of data would play out in the Ecology of the Mind. The second node I chose was about memory and the Hippocampus: “It is widely agreed that while the hippocampus is undeniably important for memory, the “recording” of information into long-term memory involves plasticity, or physical changes, in multiple regions throughout the entire nervous system. Another interesting distinction that scientists have made in types of memory is between declarative memory, which allows you to remember facts and is extremely complex, and reflexive memory, which usually consists of learning by repetition and often involves motor learning. While declarative memory can be reported, reflexive memory is exhibited by performance of a task and cannot be expressed verbally. It is now thought that the two types of memory may involve two entirely different neuronal circuits.” I connected this node and the one above to Hardware/Software theory because a lot of how the writers describe processes in the brain sounds a great like how computer techies describe processes in computers. The hippocampus reminds me of a CPU and how it stores all of the information, sending out data to be represented as pixelated images on the monitor and being accessed by people through movements with the mouse (or screen if it’s touch sensitive). However, I also chose this quote for another reason. The writers describe “entirely different neuronal circuits,” which sounds similar to what I have been reading about for this week’s reading notes in Manuel Castells’ book The Rise of the Network Society. Next Sunday, my plan is to create a node regarding how there are different layers of networks within the Network Society to connect to this quote about the hippocampus. When I think of the brain, I think of one mechanism moving everything through, so the idea of different neuronal circuits operating in conjunction gives me a different picture of how my mental process works. The last of my nodes was an image of a Synapse. I connected with a quote from Syverson: “In a complex system, a network of independent agents–people, atoms, neurons, or molecules, for instance–act and interact in parallel with each other, simultaneously reacting to and co-constructing their own environment” (3). The reason I chose this quote in particular is because it helped me to imagine what she talking about. Here, each piece has a part to play to keep the system functioning. The neurons, pre- and post-, within the synapses, working to create memories, crafting the mental environment. The images and videos gave me an idea of how stuff moves between networks more concretely than the idea of just information, though I’m amazed at the idea of electricity in the brain helping to move stuff along. Image of a Synapse. Image hosted on Annenberg Learner, textbook chapter on Neurobiology. Okay, I can admit that this week’s Reading Notes topic scared me…a lot. When I heard that we would be reading an online textbook on Neurobiology, my brain just couldn’t deal… I’m pretty sure that every time I opened the website, peeking between my fingers, my face looked like this. Bloo from Foster’s Home for Imaginary Friends makes the best faces. And, I may have done this… once or twice. Running and screaming. I found this gif (and the one of Bloo) from a review by Katrina Passick Lumsden (amazing reviewer that she is) on Good Reads. My relationship with science ended after my first year of freshman year in college when I took Astronomy and Physics back to back. So, what do I remember from days with the terms “centripetal force” and “kinematic equations”? Ummm, yeah. 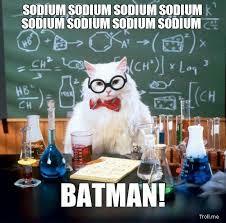 Chemisty cat meme embodies all that I can remember of science. Once I stopped panicking over words like “neuronal” and “postsynaptic neurons,” it was time to get to work. I know that the brain, with its seemingly endless nodes and connections, all contained within the skull, was the essence of a network. But, I had to really think about how I could use nueroscience within an English course. The brain may be where all of our ideas begin, allowing us to be creative and critical, but how would that fit with Foucault, with ecology, with rhetorical situation and genre boundaries? How could I curl neuronal impulses into my understanding of World of Warcraft guilds? That’s really the whole point, though, isn’t it? The brain is at the heart of all human activity (even when it appears otherwise), its design inspiring the shape and functionality of our networks of communication, of architecture, of science. I may not understand all the ways in which potassium, calcium, and sodium help in terms of neurotransmistters and synapses, but I do understand that our brain is really just an information highway that is always sending and receiving, and that what scientists are currently uncovering are new understandings of how memory works. Now that we have some vocabulary whirling around in our brains, what do we do with all of this information? How do we process it without feeling those very brainwaves start to implode the system? I wish I had an easy answer for that. What I understood from this textbook (besides the totally encompassing feeling that I know very little, even after years of being in an academic setting, trying rigorously to put an end to my ignorance. Socrates and Plato would be proud), is the ideas of connections, of information moving from place to place, initiated by the sensorial neurons that go into our system, get us thinking, and then the neurons that lead that information outwards into reactions. What surprised me was the research that had uncovered the fact that our brains do not stop changing, stop growing after a certain point. Instead, new connections are constantly being made on a daily basis, with the activities and encounters of the day helping to shape the interactions going on in the brain. The brain may be something that needs just as much exercise (mental exercise) as muscles do, but I found it absolutely fascinating that researchers could push past older ideas about how the brain works, especially in terms of aging, to explore Neurogenesis. Once I got off on that train of thought, I started thinking about how these scientists are playing into and reacting against what the larger Mind of Bateson’s Ecology of the Mind was talking about. By harnessing advancements in computer technology, the neurobiologists are constantly pushing deeper into activities in the brain. For every new discovery, this information could be filtered outwards into the collective imagination of a non-scientist population (of which I am heartily a member), to help with innovations in the classroom (the memory research is quite useful in understanding how and why educational practices succeed and fail) as well as with daily life for adults. The textbook blew my mind with the idea that, “Memory and, thus, learning involves molecular changes in the brain. During the last few decades, researchers have started to map the molecular processes involved in memory formation. They have been increasingly able to link the ability to remember with physical changes in the structure of neurons.” When I think of memory, I don’t think of molecular processes (it’s sort of like going to the grocery store and not wondering where all of the food actually comes from. It’s just there, is usually nutritious, and is already categorized along aisles like it won’t be when I stuff it in my shelves or fridge). Memory for me has always been about the experience and reconstruction of that experience in my faulty memory recall. Daniel Kahneman’s TED Talk “Experience vs. Memory” and a smattering of science articles on the processes of the brain were really all the foundation I’ve had. I wish I could say that I retained more of the reading for this week, but I mostly walked away with the image of the scientist slicing the rat brain apart so he could experiment on the pieces, and with the understanding of how drugs like cocaine affect the rewards pathway of users. The reward pathway is an interesting concept, allowing me to understand why we do what we do in order to stimulate parts of the brain through activities that reward us in some way (usually with pleasure), such as eating and exercising. This makes me wonder about research that looks at people’s brains when they are playing video games and whether or not the constant buzz of boredom that video game scholars have discussed causes the reward pathway to be activated. It’s something to think about, actually it’s all something to think about. Overall, this week’s readings made more sense when friends tried to explain pre/postsynaptic neuron activity with analogies that included Terminator, gnomes and elves and dwarves, and Riders of Rohan. One lesson to take away? As in any network, information traveling from place to place, interacting with and reacting against other information being dispersed outwards. **Side note: To supplement the textbook reading, I turned to PBS, with their video Blueprint for the Brain. Again, the focus was on the connections being made, the pathways neurons follow, and what these connections do for us. How did it feel to reach the end of the textbook with most of my synapses and neurons and long-term pontentiation intact? Dancing and flailing. Image hosted on the Tumblr All the Supernatural Gifs. “Unit Chapter: Neurobiology.” Learner.org. Annenberg Foundation, 2013. Web. 27 March 2014.